Alice Montacute, suo jure 5th Countess of Salisbury. 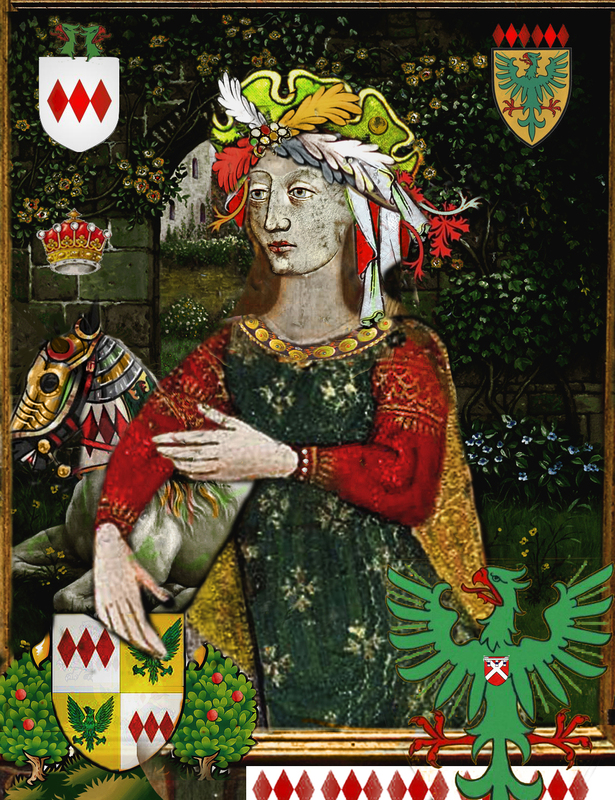 Lady Alice Montacute (1407 – bef. 9 December 1462) was an English noblewoman in her own right as the suo jure 5th Countess of Salisbury, 6th Baroness Monthermer, and 7th and 4th Baroness Montacute having succeeded to the titles in 1428. Alice was born in 1407, the daughter and only legitimate child, of Sir Thomas Montacute, 4th Earl of Salisbury [descendant of Edward I] and Lady Eleanor Holland, who was the daughter of Sir Thomas Holland, 2nd Earl of Kent and Lady Alice FitzAlan. The Earl of Kent was a grandson of Lady Joan of Kent who became Princess of Wales upon her marriage to Edward, the Black, Prince of Wales, heir to King Edward III. As the Prince of Wales predeceased his father, Edward was succeeded by his grandson by Lady Joan, Richard who became King Richard II. The Earl of Kent’s wife, Lady Alice FitzAlan, was a daughter of Sir Richard FitzAlan, 10th Earl of Arundel and Lady Eleanor of Lancaster; granddaughter of Prince Edmund, 1st Earl of Lancaster and his wife Blanche of Artois. The 1st Earl of Lancaster was the younger son of Henry III and as such was brother to Edward I. Blanche was the widow of Henry I of Navarre and mother to Queen Regnant Joan I of Navarre. Coincidentally, Queen Joan married Philip IV of France by whom she had Isabel of France, queen consort of England and ancestress to most of the royalty and nobility at court as the mother of King Edward III of England. In 1420, she married Richard Neville, who became the 5th Earl of Salisbury by right of his wife on the death of her father the 4th Earl in 1428. Richard was the eldest son of Sir Ralph, Earl of Westmorland and his second wife Lady Joan Beaufort, the legitimized daughter of Prince John of Gaunt, 1st Duke of Lancaster and Titular King of Castile. As the grandson of the Duke of Lancaster, Richard was put above his brothers and sisters from his father’s first marriage to Lady Margaret Stafford. Richard did not inherit the title of Earl of Westmorland, but the marriage to the heiress of the Earl of Salisbury was a good match which gave him a title. In short, the children by Westmorland and his second wife, Lady Joan, were given precedence over the children of his first marriage due to Joan’s status. This would cause rifts within the family for quite some time. The Neville family was one of the oldest and most powerful families of the North. They had a long standing tradition of military service and a reputation for seeking power at the cost of the loyalty to the crown as would be demonstrated by the Earl and Countess’s eldest son, Richard, the 16th Earl of Warwick. Warwick would become the wealthiest and most powerful English peer of his age, with political connections that went beyond the country’s borders. One of the main protagonists in the Wars of the Roses, he was instrumental in the deposition of two kings, a fact which later earned him his epithet of “Kingmaker”. 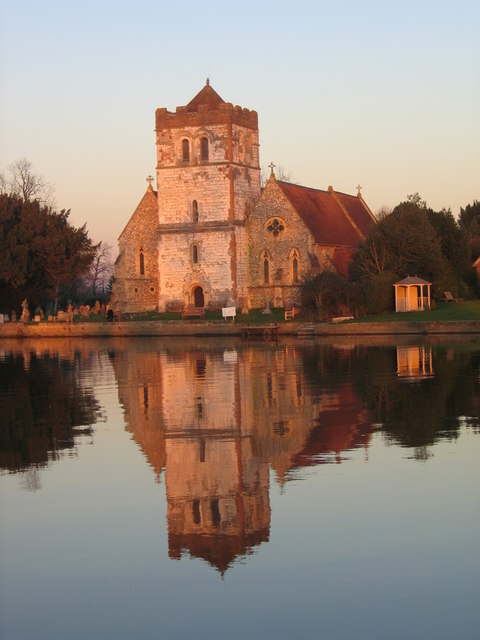 Bisham Abbey where the Montacute Earls of Salisbury are buried. Alice and Richard had ten children who survived infancy including Katherine Parr’s great-grandmother, Lady Alice Neville and Richard Neville, 16th Earl of Warwick [“Warwick, the Kingmaker”]. By Warwick, she was the grandmother of Queen Anne Neville and great-grandmother to Margaret Pole [Plantagenet], 8th Countess of Salisbury. Another daughter, Eleanor Neville, married the would be fourth husband of Lady Margaret Beaufort, Thomas Stanley, Earl of Derby and had issue. Another daughter, Lady Katherine Neville would go on to marry William Bonville, Baron of Harrington and would become mother to Cecily Bonville, the great-grandmother of Lady Jane Grey. Lady Salisbury was mother to Queen Katherine Parr’s paternal great-grandmother also named Alice [born Neville]. Lady Salisbury was also great-grandmother to Lady [Princess] Margaret of Clarence who would become the 8th Countess of Salisbury in her own right during the reign of King Henry VIII as the daughter of Lady Isabel, Duchess of Clarence; the eldest daughter of Richard Neville, 16th Earl of Warwick [Warwick, the Kingmaker]. She was the last descendant of the Plantagenet House of York who would be executed by the man who elevated her, Henry VIII. This entry was posted in The Family of Katherine Parr, The Plantagenets (1154-1485), The War of the Roses (1455-1485) by tudorqueen6. Bookmark the permalink.